Depending on your choices at the end of Episode 3 will have a strong impact on who’s still alive, friend or foe. There are turns in Episodes 4 and 5 where having a foe still be alive could be helpful. Once the flashback ends where we learn a little more about Javier and David’s past, we finally get another chance to punch David in the face! Feels SOOOooo good! Anyway, we get thrown back into the “cell” and Joan takes David away. Figuring out how to get out of the cell might take a minute, due to the terrible camera controls this entire genre of game has, but we get to see a moment where your previous actions matter in who helps you out. On one hand, it could be Kate; who should not be moving around at all, you know, because remember, a gunshot to the gut; or it could be Gabe. If it’s Gabe, you’re on the storyline in favor of helping David. One way or another, you’ll pick up Ava as an ally. After rallying the troops, we get some guns and a little stabbed in the shoulder. Ava sends us over to medical, where Lingard could help us patch up Javier. We find Lingard passed out from his habit of raiding his med stash and Clem searching through the cabinets. We learn that Clementine has some first aid skills and that Lingard wants to die. Once we get back to the group holding up at Eleanor’s place, we have a little back and forth with everyone, Kate freaks out about Javier’s shoulder and expresses more emotion about Javier’s well-being than she probably should. Well, unless she’s not caring about showing everyone how she feels about him. Anyway, I love Clem’s sarcastic remarks during this scene. After the, “Oh, Javier, you got stabbed” stuff, we get to a point where previous decisions seriously impact what happens. You will either leave in Trip and Eleanor’s good graces or you won’t. Either way, Ava sends us after a truck. After getting the truck, we have to sit and wait for Ava’s signal. Gabe and Clem get their first alone time in a good while. We get to see their little relationship grow. It is kind of adorable. Then, BAM! Ava calls on the walkie to tell us that Joan has David strung up in the square, ready to be executed. Needless to say, we gear up and head to the square. Here is where things get kind of dumb. I mean, the crowd interaction, at this point, is little to none and with this type of rally, you would think they could be persuaded to help you or not. It really boils down to how you want to deal with Joan. After you make your choices, you’ll save David, but you will have lost a friend. On to Episode 5. At the beginning of Episode 5, we are thrown into another flashback where we are, yet again, reminded how much of a jerk David is, getting a serious introduction into who Javier and David’s father was. We learn about how grandpa died, before he was turned. We also learn that he really wanted daughters instead of two idiot boys. After a game of dominoes and a small argument, we get back to the action in Richmond. After Javier fights his way to the truck, we see that Kate has managed to survive. We find Clem teaching Gabe how to survive before we take refuge in the hotel. Having an awkward reunion with Eleanor, we are reminded how dangerous David is. After everyone looks at David like the monster he is, it starts to dawn on him that his actions are unacceptable. Not to make things any more awkward, we run into the person who Joan didn’t kill on the rooftop of the hotel. It takes some strong people to get over the betrayal and overall jacked-up situation. The group takes a hard look at Richmond and it’s lost to the walkers. Using the fire escape and rooftops, they work their way to the edge of town. Somehow we magically find our way to the overpass that is going to take us to the water tower. Everything appears to be smooth sailing until we reach a break in the overpass held together by a downed helicopter. Javier — lucky us — barely survives swinging across the breach. We make it to the water tower and the place is full of walkers. Clem tells us the trick about covering ourselves in walker guts to get through them. After making it safely to the garage, David yet again shows his true colors and pulls a 180 and uproots the plan. He’s delusional about him being in charge of “his family.” Kate and Javier quickly put a stop to his insanity. However, Gabe is quick to go with his dad. 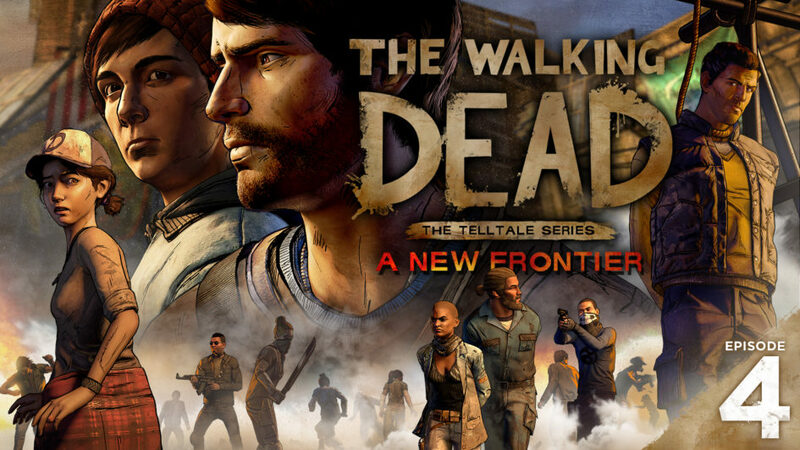 Depending on your choices throughout the episodes, Clem has put her loyalty in Javier. Choosing between going after David and Gabe or helping Kate is probably one of the biggest decisions you’ll make this entire time. Save your family or save a town full of strangers. So… from this point on is the end of the game and I’ve spoiled enough already. Let’s just say people are gonna die and some people are gonna live. But the most important thing is… we do get to see Jesus again. I did see a few glitches and things that I would have never passed in QA. If I were to request a feature to be added to the game, it would be a movie replay option. It’s nice that we can go back and see what choices we made as a stat sheet, but it would be nice to sit back and just watch the show — especially after finishing the last episode. I would be fine with some of these characters being brought into the show. Being within a few days’ travel from The Kingdom or The Hilltop, I’m already surprised there hasn’t been mention of Prescott or Richmond in the show. Overall, I did enjoy the storyline of this series. It will be interesting to see what the next series brings to the table.